Yes, we prepare all loan packages presented through our company and pride ourselves on accuracy and thoroughness. Just provide the documentation required and we do the rest. Depending on which service you require and the nature of the project, time varies from just 45 days to up to 2 months and more. The average business loan presentation is 30 days with an initial approval within 15 days of submission to Lender. Yes, we provide our services nationwide and have funded franchise loans from all parts of the country. Diamond Financial Services has established relationships with the largest and most aggressive lenders from all over to provide you with the best rates and terms. Our databanks provide specific lenders that specialize in Franchise Lending. No, we can provide you with the basic funding strategies and the know-how to increase your percentages to give you the highest possible chance of loan approval. But final approval is entirely a lenders decision. The interest rate (regulated by SBA law) cannot exceed 2.75% over prime. This is the highest allowable and depending on individual request the rate may be lower. Not on any loans with up to 15 year terms. Most Franchise loans are 10 years. 8. "What size loans do you do?" Our minimum loan amount is $100,000 and our maximum is $3 million. Most local banks are very conservative, require lots of collateral and experience, and usually only fund larger size loans. 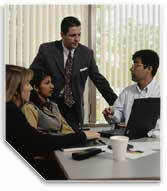 Because we are franchise financing specialists and will maximize your chances of loan approval.